Indian River Inlet, DE: The Citizens Advisory Committee (CAC) of the Delaware Center for the Inland Bays (CIB) will launch the ‘Your Creek’ initiative at its May meeting on Thursday, May 15 at 5 p.m. The meeting will be held at the CIB office on Inlet Road in Delaware Seashore State Park, just north of Indian River Inlet Bridge, and the public is welcome to attend. 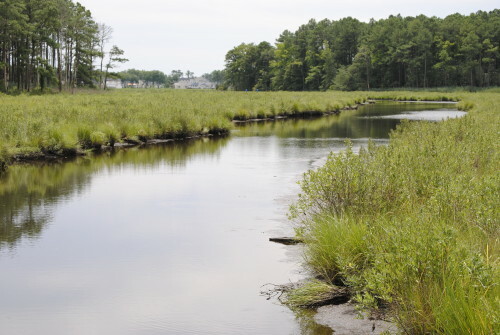 The three-year ‘Your Creek’ project to connect residents with their local creeks will begin with Love Creek, a tributary of Rehoboth Bay. One focus of the project will be to provide information on the status and trends of water quality in the rivers and creeks that flow into the Inland Bays to the residents who live near them. Joe Farrell, Program Manager for the Inland Bays Citizens Water Monitoring Program will present ‘Testing the Waters…Monitoring Water Quality on the Inland Bays.’ Since 1991, a corps of citizen scientist volunteers has collected water samples at assigned sites around the three Inland Bays-Rehoboth, Indian River and Little Assawoman- and along its tributaries, to measure a range of water quality characteristics such as dissolved oxygen, water clarity, harmful algae, and bacteria levels. The work done by these volunteers provides scientists and managers with information that can help guide natural resource management and inform public policy. The program is managed by the University of Delaware Sea Grant Marine Advisory Service at the College of Earth, Ocean, and Environment in Lewes. Also presenting, Eric Buehl, Land Protection and Restoration Coordinator for the CIB, will take us on a ‘then and now’ tour of the Love Creek sub-watershed from the mouth to the headwaters looking at historical maps, aerial views, and highlighting unique features such as sea level fens, Delmarva Bays and old mill ponds. He’ll give us clues about how to look at the landscape to see the traces of former land uses and natural features. Anyone interested in learning more about their creek or in joining a ‘Your Creek’ team is encouraged to attend this meeting. The Inland Bays Citizens Advisory Committee (CAC) is a standing committee of the Board of Directors of the Delaware Center for the Inland Bays. Its members represent a cross-section of communities and interest groups in the Inland Bays watershed and are charged with bringing issues of public concern related to protection of the Inland Bays and its watershed to the CIB Board. The committee welcomes all interested people to their meetings and hopes that many will consider joining in this important work.